Unregulated Cash, under jockey Martin Osuna, prevails over Jazzy Icon in the $20,805 Desert Classic Derby Sunday afternoon at Turf Paradise Race Course. PHOENIX, AZ—NOVEMBER 4, 2018—Unregulated Cash won his fourth consecutive race on Sunday afternoon in the $20,805 Desert Classic Derby at Turf Paradise. 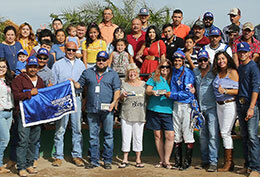 Martin Osuna rode the 3-year-old gelding to victory in the 350-yard race in 17.759 to earn a 93 speed index. The pair finished a neck in front of Jazzy Icon in second place. Unregulated Cash ($3.20) has been trained by Jose Botello in his three Arizona starts after moving from the Paul Jones barn at Los Alamitos, where his current win streak began in a claiming event in December 2017. AQRA Executive Director Loretta Brasher presents the winning connection of Unregulated Cash the Desert Classic Derby stakes trophy on Sunday at Turf Paradise. Botello also owns the son of Favorite Cartel. He was bred in Oklahoma by Paul Jones and Vince Greco, out of the Check Him Out mare Checkcashingability. With the win on Sunday, Unregulated Cash now has five wins in 12 starts and has earned $41,291 to date. His most recent win was in April in the $37,000 AQRA Presidents Derby. Jazzy Icon and Mark Jesso finished in second place for trainer Matt Fales. Martha Wells owns and bred the Texas Icon gelding in Arizona, out of Icebreaker, by Bono Jazz. Jazzy Icon has hit the board in six of his eight starts at Turf Paradise and is three for 14 lifetime. 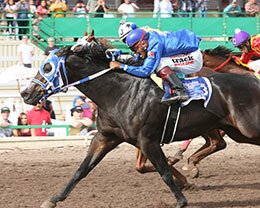 He was fourth in the AQRA President’s Derby, behind Unregulated Cash, and won the AQRA President’s Fall Futurity at Turf Paradise last October. Completing the trifecta was Marshall Valentine and Emilio Tapia for trainer Eloy Mendoza. The gelding was bred in Arizona by his owner, Fernando Canales, by The Bounty Man and out of the Panther Mountain mare Terri Tazer. Marshall Valentine has raced almost exclusively at Turf Paradise and was making his fourth start in a stakes race. He is two for ten lifetime with earnings of $13,905. Completing the field were Nicos Favoritecartel, Priteville Cartel, Hw Double Down Perry, Shakin Cash, Cowgirl N Up, Miss First N Wild and Sheza Sweet Fire.